The Paul Mitchell Group last appeared at Rockway in 2016. They are a talented group of musicians under the leadership of trumpeter Paul Mitchell. Their repertoire covers everything from Jelly Roll Morton, Satchmo, Bobby Hackett, Jack Teagarden, George Lewis and more. They love playing the old time jazz from New Orleans, to Chicago, to Kitchener-Waterloo. The group has recently been featured three times at the new venue in Uptown Waterloo's Heuther Hotel called "The Jazz Room". 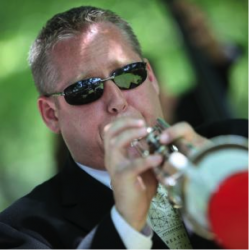 Paul Mitchell - trumpet - is a fiery performer and band leader from the KW area, with a storied resume. His bristling technique and fun sense of humour pervades his playing. Paul excels in all kinds of music from Steeley Dan to Fats Waller. He's always a crowd pleaser. Larry Smith - guitar - is a master of numerous guitar styles, especially older jazz after listening in his early years to his parents’ records of Fats Waller and Louis Armstrong. Larry is a fine singer and consummate entertainer, and the backbone of any rhythm section. Peter Hysen - bass - a multi-instrumentalist from London who is equally proficient on tuba, the bass fiddle or trombone. He is an accomplished arranger and performs regularly with the incredible "Humber College Alumni Orchestra". Brian McHugh - drums - keeps the beat and has 'swung' with the best. He once played a "swinging woodblock" solo for the 'queen mum', and managed to get a smile out of her with his bombastic playing. Undoubtedly he'll make you smile too! Mike Polci – trombone - has an honours bachelor of music from University of Western Ontario. He has studied trombone with Joseph Castello of the KW Symphony. Positions he holds currently are second trombonist - Orchestra London Canada, second trombonist - Hamilton Philharmonic Orchestra, principal trombonist - Toronto Philharmonic. He is also leader of the Dixie Dawgs and has shared the stage with Diana Krall, Moe Koffman, Cab Calloway, Mickey Rooney, The Temptations, The Supremes, Frank Sinatra Jr.., Marvin Hamlisch, Ray Charles and Shirley Jones. Chris Robinson – is a veteran of the Canadian jazz scene. Tenor, soprano, alto saxophone and clarinet are his horns and he plays in a modern but lyrical style. His first CD “Pleased to Meet You” released in 2002 was voted in the top 40 CD’s of the year by Canada’s Jazz station 91.1 CJRT FM. His most recent recording with The Gene Poolboys “A Child is Born“ is currently enjoying extensive airplay on 91.1 Jazz FM. Chris has been performing regularly every Friday evening at the Drake hotel with pianist Richard Whitehouse and Wednesdays at the Reposado bar with his trio. Chris has performed with Peter Appleyard, Bernie Senensky, Oliver Jones, Neil Swainson, Marcus Belgrave, the Canadian Jazz Messengers, and The Benny Goodman Alumni Orchestra. He recorded on Justin Time with the Oliver Whitehead Quintet and was nominated for best jazz album at the 1985 Juno awards.